It always seems like summer gets jammed up behind the 4th of July. Our little town is a destination spot with thousands of visitors converging upon our town and beaches. The crowds, coupled with hot-for-us weather can try the patience. Even our amiable shop keepers lose their cool once in a while! Yesterday my mate and I spent the morning preparing to march in our parade. My guy pulls together a local marching band every year. We are lined up and ready to march before 1:00 and away we go through a solid tunnel of people. Here is a 20 sec. video clip. It is rough and shaky as I took it with my phone, while marching and banging a drum. Directly from the parade we jumped into our truck and headed up to Cannon Beach where my husband was playing a two hour concert in the park with another band he is in. In case you are wondering, I am marching directly behind him in the video, he is the one with the trumpet! We made it through that and the late, late night (it doesn't start to get really dark until after 10:00pm) firework show and general town craziness. It has been good to rest today. In the meantime, I have been painting and drawing. 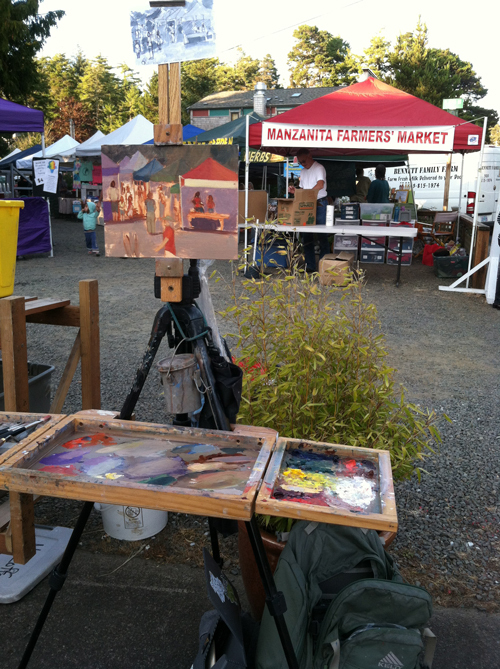 I have painted at three of the four markets and am getting better each time. Here is a picture of the one before last in progress. I still have a ways to go. I decided not to paint at the July 3rd market. I brought a sketchbook and sketched the people. There were so many people that I wouldn't have been able to see or move! I have been out plein air painting as well. 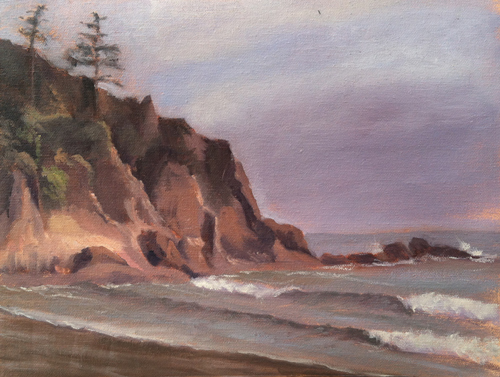 Here is a study of the south end of Short Sands beach. © 2015 R.L. Delight, South End Shorty Study, 9"x12", oil on canvas, plein air. I am also participating in a local show called Word and Image and have started to work on my painting for that. I will be posting on the show, and the work in progress soon. I know I have been a bit remiss at regular blogging. It has been a super busy summer so far. I will do better. It is easier to post at least once a week so things don't get stacked up and crammed all together like this. I also had to leave a lot out.